After years of decline and four days of intensive planning, the drive to transform Jamestown Mall moved into the "what if" stage on Tuesday night. For example: What if, instead of a large, empty Sears building and a deserted parking lot at the corner of Lindbergh and Old Jamestown Road, there were mixed housing, shops, restaurants, a farmers' market and more intimate, walkable space, designed not to draw shoppers from a wide area but to serve the needs of people who live in the area? What the Jamestown Mall site might look like. That's the kind of revisioning that the four-day process held at St. Louis Community College at Florissant Valley spawned -- a chance to take a site whose best days are behind it and look toward the future. "Can you see it in your mind's eye?" St. Louis County Executive Charlie Dooley asked the crowd of 50 people or so who showed up for the final session of the design exercise. "That's where it starts." The process actually began Thursday night, when about 100 people broke into 10 teams to brainstorm and visualize what the site's 142 acres could become in an era where big malls have fallen into disfavor. Those ideas were refined over the next several days by a team led by Dover, Kohl & Partners, a town planning firm based in Coral Gables, Fla. The results of the process were presented Tuesday night by Victor Dover, who stressed that the vision remains a work in progress that will be further refined, then presented to the St. Louis County Economic Council by the end of the year. After that, the hard work of turning the plan into reality will begin -- a transformation that Dover, Dooley and others stressed is not going to happen quickly. "It didn't get this way overnight," Dooley told the crowd. "It's going to take some time to get out of it." "Any dramatic change or rebuilding will likely take five years or more to begin (or perhaps much longer)"
Dover explained that the final plan was determined by a set of principles that drove the vision and a set of realities that will shape what is finally built. A complex quilt of private property owners within what Dover called an "oddball geometry"
Taking into account all of the ideas that interested parties had expressed in earlier sessions, Dover said his team had done an economic assessment to determine which were most doable and which were least likely to ever become reality. The least realistic proposals included a convention center, an aquarium, a big box retailer like IKEA, an amusement park, a cultural center or reusing the mall for retail. Much more feasible, he said, were housing for senior living, movies, offices, medical offices, parks and small-scale retail. The problem with larger retail, Dover said, was that according to common measures -- a seven-minute drive time that shoppers were willing to accept to get to stores -- the Jamestown site could only support 600,000 square feet. The current shopping center has twice that amount of retail space, much of it abandoned. But with competition from the nearby Shoppes at Cross Keys and Crossing at Halls Ferry, he said, the site really could only support 200,000 square feet of retail space, so other uses for the area are clearly needed. That analysis fits in with what people said they would like to see the Jamestown Mall location become, Dover said, a place where people can gather, like they used to. It can become that way again, he added, if people are able to shake their view of what the site has become. "One of our problems as human beings," he said, "is that we see something like Jamestown Mall and we say, it's been built already. But really, it's not finished." At the end of the evening, members of the audience were given questionnaires that will be given to the planners who will refine their concept before presenting it to the county. 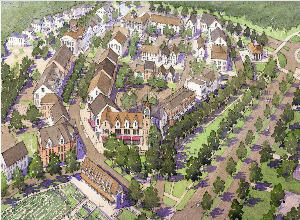 The revised plan will be even more precise, Dover said. Dooley urged those who are interested in the plan to chime in with their thoughts, then make sure they stay involved so the site becomes what they want it to be. "We want you to be proud of where you live," he said. "It's not going to happen tomorrow or next week. But it will happen if you stay the course." Goodbye, Jamestown Mall -- Hello, Lindbergh Place?